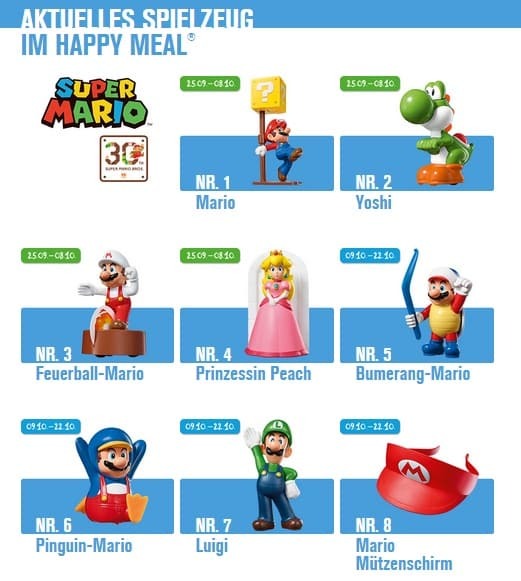 Having made a return appearance in the United Kingdom, McDonald’s has announced that Super Mario toys have returned to their Happy Meals in Germany. Helping to celebrate the 30 years since Super Mario Bros. launched, Mario, Yoshi, Fire Mario (Feuerball-Mario) and Princess Peach (Prinzessin Peach) will be available between Friday 25th September – 8th October 2015. These will be followed by Boomerang Mario (Bumerang-Mario), Penguin Mario (Pinguin-Mario), Luigi and a Mario visor (Mario Mützenschirm), which will roll out between 9th – 22nd October 2015. It’s unclear whether, as with the UK, the toys will be supported by the Team Mario Activity Days and appearances by the Italian plumber himself. But, it’s another chance for collectors to secure themselves the complete range of Super Mario toys. Good luck to those hunting!